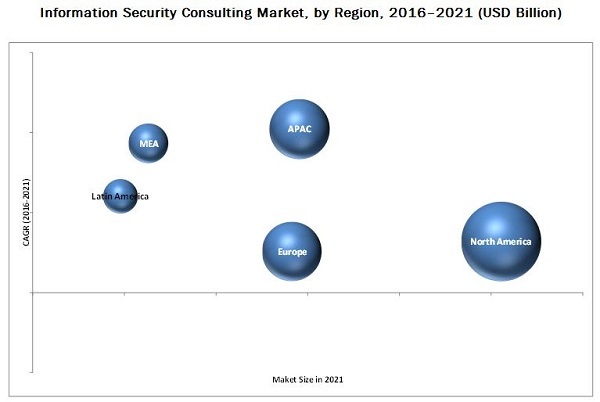 [118 Pages Report] The overall information security consulting market is expected to grow from USD 14.31 billion in 2015 to USD 26.15 billion by 2021, at a CAGR of 10.2% from 2016 to 2021. The information security consulting services cover all security aspects of today’s borderless enterprises from basic compliance requirements to risk management, and traditional network layer security to advanced application layer security. Internet of Things (IoT), cloud, and Bring Your Own Device (BYOD) are some of the newest technologies and trends that demand high-level of security, which, in turn, help in the growth of the market. The information security consulting services being used in many industry verticals such as aerospace and defense; government and public utilities; BFSI; IT and telecom; healthcare; retail; manufacturing; and others (education, media and entertainment, and automotive). The base year considered for the study is 2015, and the forecast has been provided for the period between 2016 and 2021. In today’s business environment, the organizations are rapidly expanding their business by adopting cutting-edge technological solutions. There is growth in third-party application deployment through the partners to serve large customer base. The organizations are facing challenges in outsourcing applications to their partners, as the security policies of different organizations varies and thus the security management becomes a critical task. These third-party applications and plug-ins are becoming the prime targets for evolved cyber criminals. Thus, the organizations are demanding robust security solution in such situation and the standalone security solutions do not guarantee to deliver comprehensive security. The organizations are moving to information security consulting vendors to embed a strong security policy in the organization. Similarly, the mergers and acquisitions are creating security challenge among organizations in configuring two different technologies. Moreover, the globalization of businesses has given rise to network complexities and to secure these networks is becoming troublesome task for organizations. Thus, the demand for information security consulting is increasing due to such factors. During this research study, major players operating in the information security consulting market in various regions have been identified, and their offerings, regional presence, and distribution channels have been analyzed through in-depth discussions. Top-down and bottom-up approaches have been used to determine the overall market size. Sizes of the other individual markets have been estimated using the percentage splits obtained through secondary sources such as Hoovers, Bloomberg BusinessWeek, and Factiva, along with primary respondents. The entire procedure includes the study of the annual and financial reports of the top market players and extensive interviews with industry experts such as CEOs, VPs, directors, and marketing executives for key insights (both qualitative and quantitative) pertaining to the market. The figure below shows the breakdown of the primaries on the basis of the company type, designation, and region considered during the research study. The information security consulting ecosystem comprises information security consulting services vendors, such as Ernst & Young (U.K.), IBM Corporation (U.S.), Accenture plc (Ireland), Atos SE (France), Deloitte (U.K.), KPMG (U.K.), PwC (U.K.), BAE Systems plc (U.K.), Hewlett Packard Enterprise (U.S.), and Wipro Limited (India); service providers; system integrators; and enterprises. Other stakeholders of the information security consulting market include security service providers, consulting service providers, IT service providers, resellers, enterprise users, and technology providers. In March 2016, EY expanded its business in APAC by opening four Centers of Excellence (CoE) named the Asia Pacific Center of Excellence for Cybersecurity, Asia Pacific Advisory Center, Asia Pacific Center of Excellence for Manufacturing, and Asia-Pacific Center of Excellence for Analytics. Through this expansion, the company enhanced organization’s capabilities in cyber security, analytics, manufacturing, and transformation strategy. In August 2016, IBM launched a group of cyber security professionals and ethical hackers named IBM X-Force Red. The group is aimed at detecting the vulnerabilities in organization’s IT infrastructure and mitigating the cyber threats. In December 2016, Accenture acquired Defense Point Security LLC, a leading provider of information security services and solutions to private and public industries. The company enhanced the capabilities of cyber defense and response services with this acquisition. What are new security types which the information security consulting companies are exploring? The information security consulting market size is expected to grow from USD 16.12 billion in 2016 to USD 26.15 billion by 2021, at a Compound Annual Growth Rate (CAGR) of 10.2% during the forecast period. The major growth drivers of the information security consulting market include the increased network complexities due to 3rd party applications deployment and mergers and acquisitions across globe. Information security consulting is one of the major segments in the cybersecurity services space. This includes highly qualified industry experts, domain experts, and security professionals, which help organizations to formulate cyber security strategies, prevent revenue losses, minimize risks, understand maturity of their cyber security solutions, and enhance security in the existing information system. Consulting service providers guide companies in setting up new cyber security infrastructure to address their specific security requirements in a way feasible for them. Consulting services are important for the companies because non-IT companies do not have the expertise to understand cyber security technologies and secure the organizational information. Major security types in information security are network security, application security, database security, and endpoint security. The application security is expected to grow at the highest CAGR during the forecast period because of the growing trends of Internet of Things (IoT), Bring Your Own Device (BYOD), and connected devices. Network security holds the largest share of the information security consulting market in 2016. The growth is fueled by the growing attacks on the critical network infrastructures of organizations. The BFSI vertical is expected to grow at the highest CAGR during the forecast period due to the increasing adoption of web and mobile-based business applications, which are susceptible to advanced cyber threats. The global market has been segmented on the basis of regions into North America, Europe, Asia-Pacific (APAC), Middle East and Africa (MEA), and Latin America to provide a region-specific analysis in the report. The North American region, followed by Europe, is expected to become the largest revenue generating region for information security consulting vendors in 2016. This is mainly because in the developed economies of the U.S. and Canada, there is a high focus on innovations obtained from research and development and technology. The APAC region is expected to be the fastest growing region in the information security consulting market. The growth in this region is primarily driven by the growing adoption of web and mobile based business applications. The increasing adoption of information security consulting services in aerospace and defense, government and public utilities, banking, financial services, and insurance (BFSI), and IT and telecom is fuelling the growth of the market. Security threats in the aerospace and defense vertical are increasing at an alarming rate. This sector is targeted with the purpose to extract highly confidential and sensitive data of critical sectors, including the government, prime contractors, and suppliers. The existence of big data and increased digitization in almost all the activities of the armed forces leads to high chances of being attacked by cybercriminals. Next-generation firewalls, intrusion prevention systems, anti-malware gateways, and endpoint security applications are capable of protecting data from known threats, but attackers have innovated many techniques to bypass these products and access confidential data. The information security consulting companies provide a wide range of security consulting services to the aerospace and defense vertical. The consultants provides robust information security policies and strategies to address potential cyber threats. There has been strong adoption of advanced technologies in the government and public utilities vertical in the recent years. The governments in the emerging economies are deploying web and mobile applications to serve their citizens efficiently. These applications are becoming prime targets for the cybercriminals to access sensitive data. Thus, information security consulting has become one the most important aspects in the government sector. The concept of e-governance has led the government to focus more on information security threats. Moreover, as organizations are shifting toward real-time communication, threats from web browsing, email correspondence, peer to peer traffic, and file exchange have considerably increased. The information security consultants assess the security of the IT infrastructure used by government. In addition, they provide comprehensive security strategies and train the employees about maintaining a secure environment in the organization. BFSI sector is an early adopter of cutting-edge information security solutions due to the highly sensitive financial data. It faces different challenges related to stringent regulatory and security requirements, providing superior service to customers, and others. In addition, the industry is always on the lookout for security products and services that could protect the industry’s employees, customers, assets, offices, branches, and operations, and therefore holds a significant share of the total information security consulting market. The security consultants analyze the IT ecosystems and business processes in the organization and suggests effective security policies to mitigate the potential cyber risks and maintain secure environment. IT and telecom sectors are rapidly growing in the key economies of APAC, MEA, and South America. This has expanded the networks and increased the network complexities. The companies often overlook the information security concerns due to increased focus on market share and cost reduction. This has resulted in increased attacks on the critical infrastructure used by the industry and also affected the financials of IT & telecom companies. The increased integration of Information and Communication Technology (ICT) into daily activities of industries, government, families, and consumers along with the rising sophistication levels of cyber-attacks have led the IT and telecom sector to focus more on their information security activities. 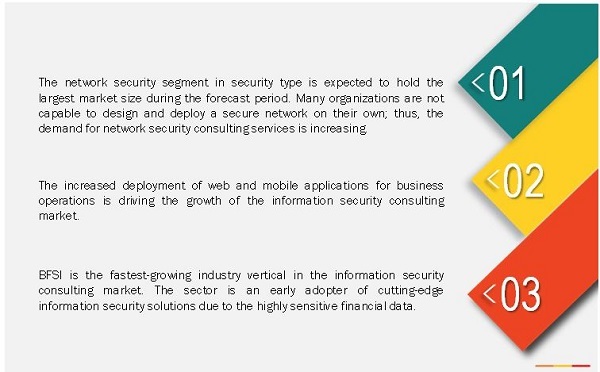 What are the upcoming industry trends in the information security consulting? The information security consulting market faces challenges such as lack of awareness about advanced cyber threats. Advanced cyber threats are diverse in nature. They target particular vulnerabilities in the network and use these vulnerabilities to get an entry into the enterprise network. With higher sophistication levels of targeted attacks, dozens of new zero-day threats have emerged. The methods and techniques with which the attackers infiltrate into an organization’s network remain undetected. Due to less awareness towards advanced cyber threats, organizations do not spend sufficient money on their security infrastructure which results into massive loss of their information property and reputation. Furthermore, the companies with pressing cyber security needs are finding that there’s a major lack of qualified professionals to fill their positions, which makes them vulnerable to cyber-attacks. Major vendors that offer information security consulting solutions across globe are Ernst & Young (U.K.), IBM Corporation (U.S.), Accenture plc (Ireland), Atos SE (France), Deloitte (U.K.), KPMG (U.K.), PwC (U.K.), BAE Systems plc (U.K.), Hewlett Packard Enterprise (U.S.), and Wipro Limited (India). These vendors have adopted different types of organic and inorganic growth strategies such as new product launches, partnerships & collaborations, and mergers & acquisitions to expand their offerings in the information security consulting market.